Drive Aluminum Crutches are lightweight aluminum with durability due to double extruded center tubing. This adds strength to areas that bear the most weight. Underarm or Walking Crutches are the popular go-to crutch style for patient's needing a mobility aid after a hip, foot or ankle surgery or injury. These Aluminum Walking Crutches are easy to use and adjust to each user by using the pushpin buttons that adjust in 1-inch increments. The hand grips can also be customized to the proper hand position using wing nut adjustments. The underarm padding and handgrip adds comfort and is latex-free to avoid allergic reactions. For increased safety, the jumbo tips provide a larger non-skid surface for traction for all surface types. The Aluminum Crutches by Drive Medical are available in Adult, Tall Adult, Youth and Pediatric. The crutches support patients up to 350 pounds and 175 pounds for the pediatric variation. Make sure to check the height specifications for each size to ensure a proper and comfortable fit. 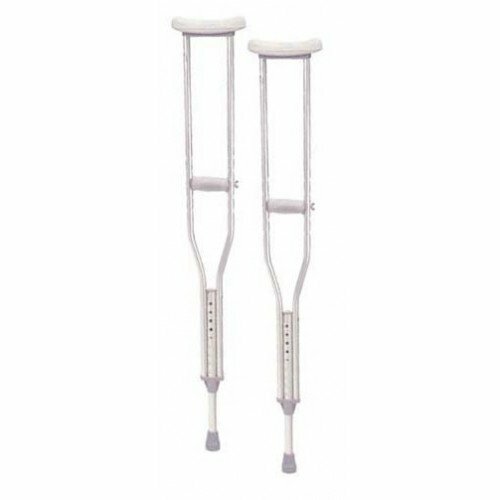 Drive Medical also manufactures crutches in heavy duty steel Bariatric Crutches to accommodate patients up to 500 pounds.